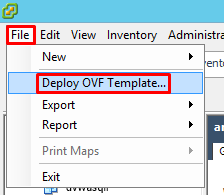 From the menu bar at the top left of your VMware vSphere Client window, click File -> Deploy OVF Template. We will try to explain the steps in below. a. Source: After you have specified the location by clicking on the Browse button of the OVA file that you have downloaded, we move to the next step with the Next button. b. OVF Template Details: You will see the details of the OVA file in this step. You can see information of the downloaded file such as the product name, the size it covers, the publisher, and the description. #Please note that: If you want to install Logsign SIEM product with the OVA file, you do not have the possibility to change the disk size. If you want to expand the disk size of Logsign SIEM after the installation, you can apply disk expansion (with LVM). #Please note that: Contact Logsign SIEM Customer Support Unit on the topic of disk expansion. c. Name and Location: You can give a name for defining Logsign SIEM product. d. Storage: Select the datastore partition where you will install Logsign SIEM and proceed to Next. e. Disk Format: In the disk format section, you should select the format of the disk-size formatting on the datastore where you will install Logsign SIEM. Thick Provision Lazy Zeroed: It allocates all of the disk space you allocate from the datastore. If you select this option, the blocks in the disk will be reset as data is written. For this reason it occurs in a short time. Thick Provision Eager Zeroed: It allocates all of the disk space you allocate from the datastore. If we choose this option, the blocks in the disc will be reset directly without writing any data. Thin Provision: It differs from our previous two (2) methods. They do not allocate disk space from the datastore. As the disc is used, it expands itself. In this section, we mark Thick Provision Lazy Zeroed and pass the last step with the Next button. f. Ready to complete: It's a screen that we can preview the settings we made. If the Power on after deployment box is ticked, your Logsign SIEM product will automatically power on after deploy. We are terminating the wizard with Finish. The setup wizard will close and you will see a small window titled Deploying Logsign SIEM. Logsign SIEM will be configured in accordance with the settings we made in the setup wizard. Average duration is 3-4 minutes and may vary depending on your hardware resources. When the process is completed, the Completed Successfully expression will be written under the Deploying Logsign SIEM article. 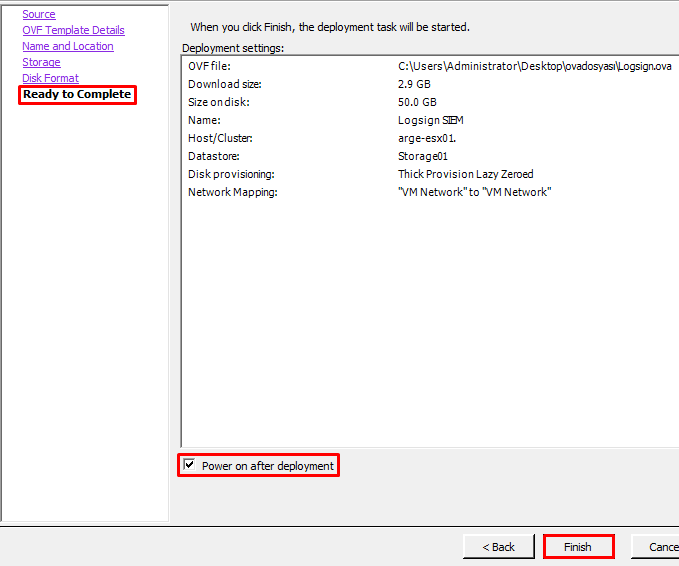 Then If you check the Power on after deployment box, your Logsign SIEM will automatically power on after this process. The display will show the name of the host operating system and the IP address of your machine. Open the WEB browser and write http://LOGSIGN_IP_ADDRESS to the address bar. Then you will be directed to the installation wizard when you write Logsign SIEM IP address. I have a License Key: If you have a license key that you have purchased, you are choosing this option.